I'm in the middle of a thing that I thought would be a great and easy-peasy idea but... well. Maybe isn't. So for the benefit of posterity and because I am bored in work, I present a review of the Linnmon cage build! As I'm sure many of you know, VanillaHamHam has a lovely video showing how she built the Linnmon cage. 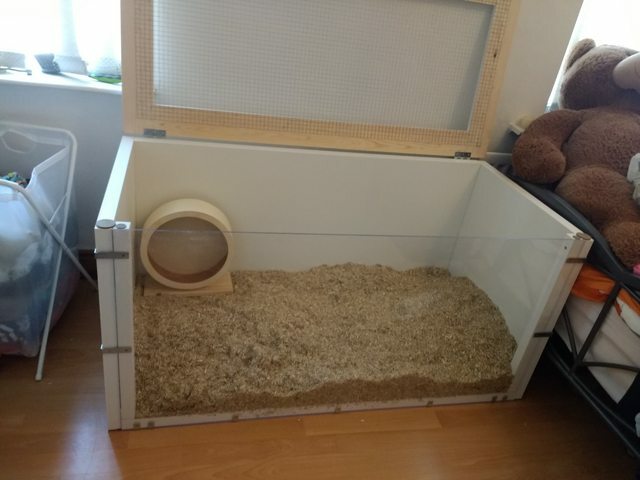 It does look super easy, it's very cheap, its a 100x60cm cage, it looks beautiful, I am very into it. 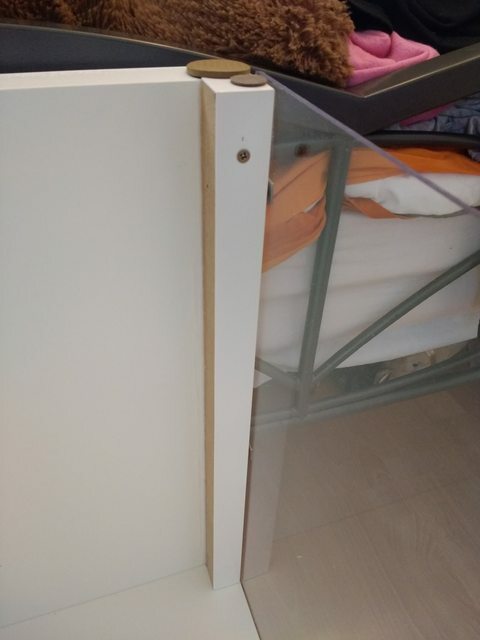 I notice that IKEA also so a 120cm Linnmon table. They are £15/each rather than £6 but I justify it to myself (somehow) so a plan starts to form. Using these tables adds £27 on immediately but maybe I need that extra 20cm? 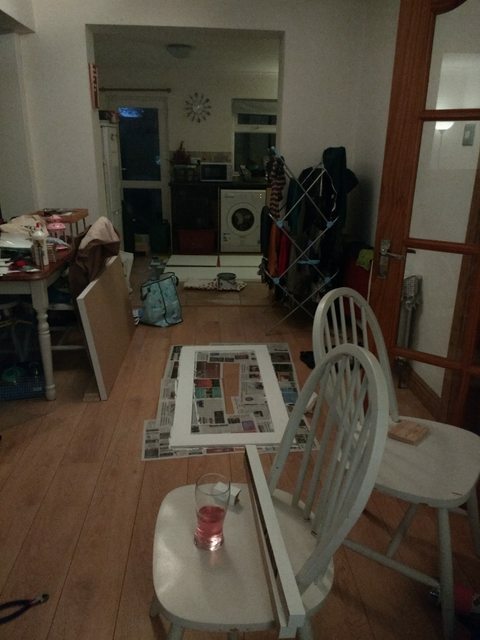 I love a spreadsheet so it all goes in there including hardware etc and some perspex I think will work well instead of glass (because I can't find an equivalent for the Hemnes glass table top). 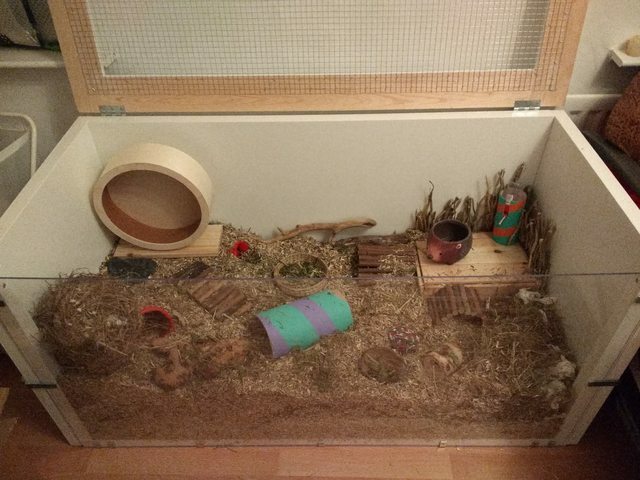 Budget sitting at about £100 which I decide is still reasonable if you consider that the Eco Habitat Large is £170 on zooplus. I also draw this up in CAD in work, reminder that I am supposed to be an engineer, this is funny considering how many mistakes I make during this. Tables get purchased, when I see them in real life I balk a little bit because they are giant but I tell myself I might regret not having that extra length someday. Go to buy timber and the spreadsheet size is not there. So that ends up more expensive, +£4. 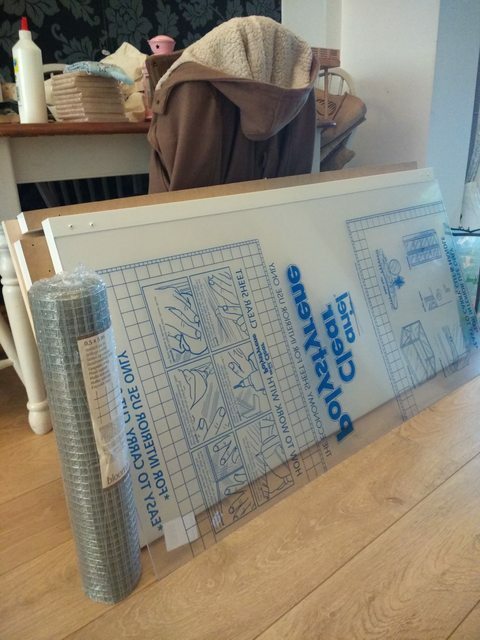 I realise at this point that the mesh sheet I was planning to buy is only 900cm long so it's too short. I buy a roll of it instead. +£3.50. The timber has been cut in half by the nice man in B&Q so it could fit in the car and we have four 120cm pieces. They actually need to be 126.8cm to cover the length of the cage. Hmm. So no nice picture frame lid, it is uglier with right angle joints but it will still work so it's fine. 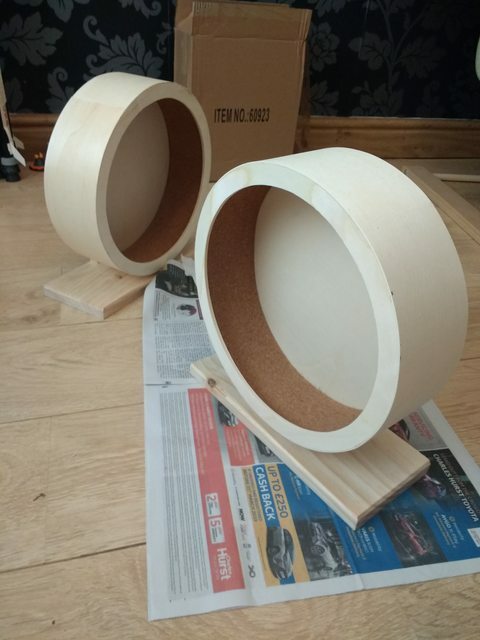 Timber gets cut by my my partner and his dad with a handy circular saw, he glues the lid together which looks lovely and smooth, everything fits, I am pleased as punch. At this point I make the mistake of saying despite some issues it is all going rather smoothly. The perspex I wanted wasn't in stock in Homebase in either of the two stores close to me. A similar one is in B&Q but when I see it in person it is wobbly as heck so I go for the 4mm rather than the 2mm, +£9. Total cost of petrol adds up here too since it was pillar to post on a Sunday evening trying to get this sorted. When I get home I drop a pot of wood sealant (£5) which is now nicely protecting the pavement outside my house. I realise the 120cm perspex is 6.8cm too short (does this sound familiar) as it has to reach the side panels. I wonder how I have the brain power to dress myself in the morning, nobody is happy at this point. Back to B&Q to get longer L-brackets (+£4.88 ). I can use the off-cuts from one of the panels to create a bearing surface for the perspex, I can glue them to the sides. (I haven't actually done this yet so this may still not work). I buy a hack-saw to cut these +£4.50. I scrape the bottomof the sealant pot to get one thin coat on these new wheels! And finally, last night, we get the blooming thing together. It is too big to be carried up the stairs so it has be be assembled in my room with Jin going mental at all the ruckus. 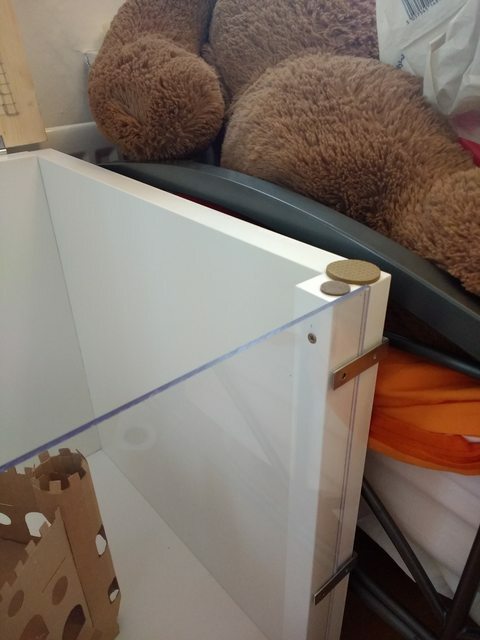 I have to lose my bedside table and rearrange the room as my plan for how to arrange the cages turns out to be garbage when I try it in real life. We put the wrong side panel on first but get that fixed. 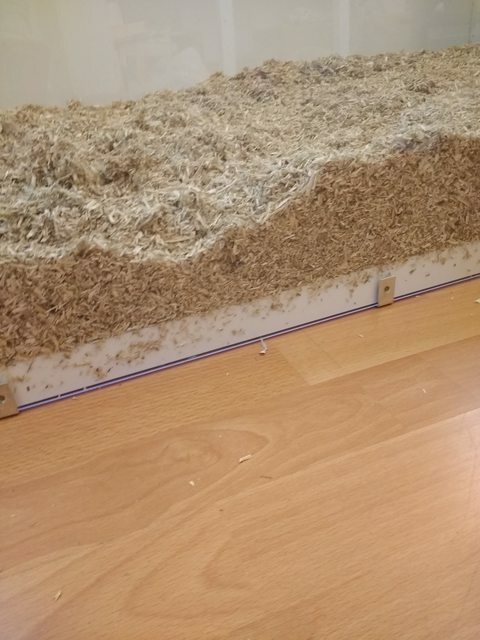 We realise that the off-cuts we are attaching to help hold the perspex are slightly too long but not too-long enough to cut with the hack-saw so my partner is stealing some sandpaper from work. Sealing it with the aquarium sealant is delayed by a day so Jin probably won't get into it before Sunday. She rips her water bottle from the wall in protest and now has to use a bowl. Tonight we stick the extra bits on, seal it, get the perspex in, get the lid hinged in place. What else can possibly go wrong??? Oh Brilliant - ha ha Shannon! 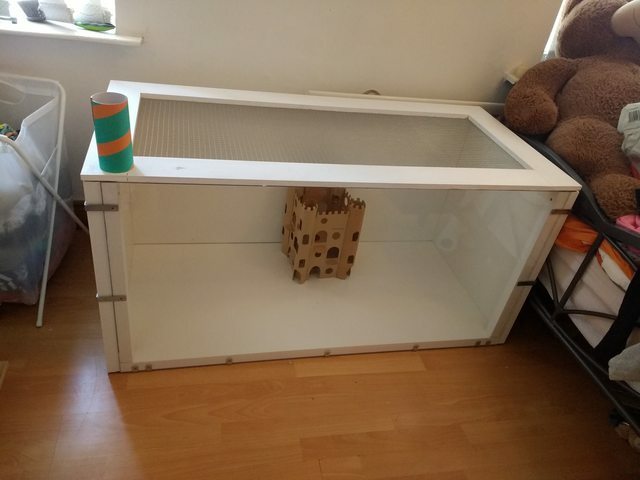 It is an amazing cage but it's why diy stresses me lol. However, now you've done it you have all the right measurements for someone else. Jin will be really happy with that. Wow haha. Hope you manage to finish it up ok! I have to say I do think the extra 20cm makes a big difference so hopefully it was worth the hassle. Should be fun setting up that space though plenty of room to keep her occupied. If she's happy it'll be worth it. Or if not happy, at least not as frustratedly destructive, I'll take that. 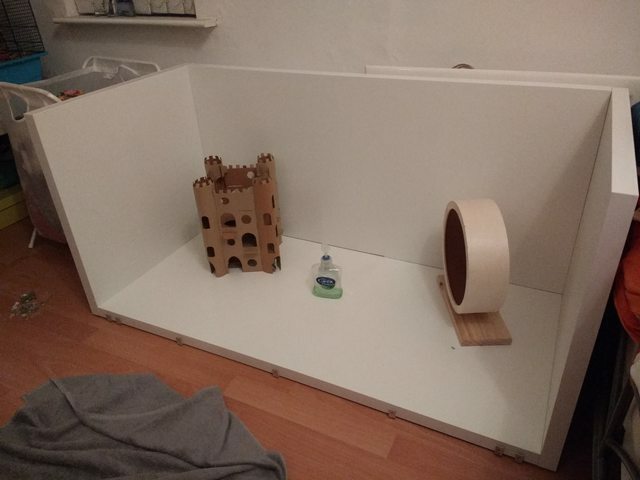 It's a really nice cage! Last night we attached the “extra bits” to hold the Perspex in place and actually I think it works really well! They’re screwed in at the top and glued with aquarium sealant and sit nicely flush. Perspex and lid went on this morning. Perspex has a scratch on it which is going to drive me up the walls but there was no way to tell until we took the plastic off so... nothing to be done. It’s held v nicely by the brackets and can still be slipped out the top if needs be. I didn’t seal the bottom edge for this reason so hemp gets down in between which is also mildly annoying but again, nothing to be done. 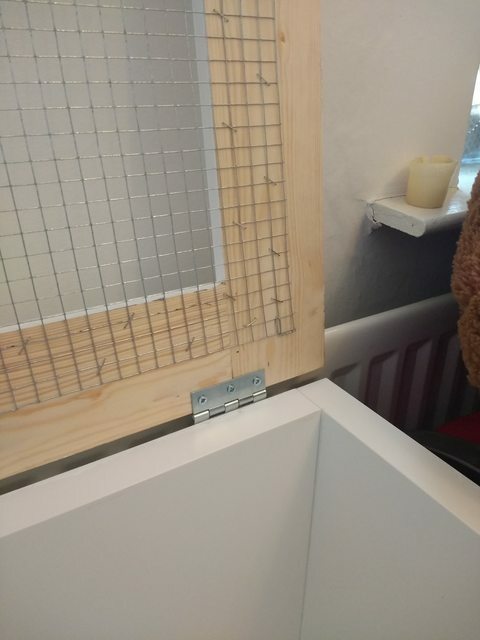 The felt pads stop the lid coming down hard on the Perspex and they’re also over all the screw ends because we didn’t countersink them. We really should have but we didn’t have the right drill bit. These should protect the floors anyway. Hinges went on really well! 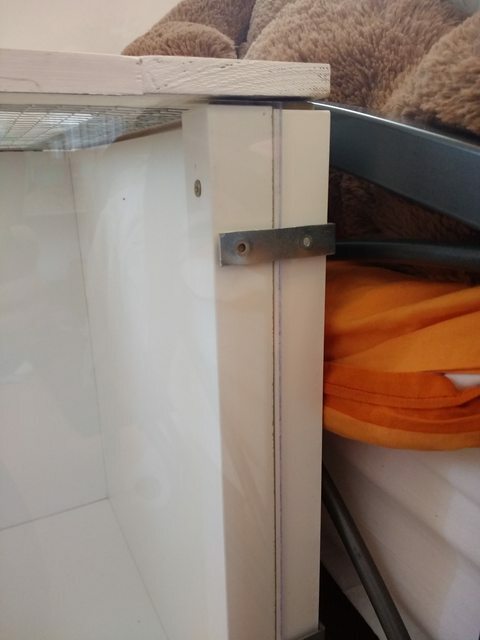 There was a good 10 minute discussion about How Do Hinges Actually Work (again, this is two structural engineers here for goodness sake) but they fit, they are smooth and turns out I was right about how hinges work in the first place which is the important thing. So that’s it! A week’s work, I stopped keeping track of the budget exactly but it’s around £120 I think. *We really should have used an impact driver because hand screwing everything was murderous. My hands are aching and tbh my partner did most of it just by virtue of having better upper body strength. He’s a good boy. And there is is with a solid 3/4 of a 140lt bag of hemp LOL. I am glad I got another one. She can be transferred over with the bedding that’s currently in her cage later this evening when she gets up! Last edited by Shannonmcn; 04-13-2019 at 03:52 AM. It does look good, and you managed to cover the fact that the plexiglass was too short really well too. Haha the hinges - I mean I'm in the same field of work and don't know how they function either so I'm thinking it must be excusable really. Hope the move goes smoothly she should have fun exploring tonight! I think she likes it! She was a bit jumpy the first night but she seems to have settled really well and good grief am I glad there’s no way she can reach any mesh to chew. Not that she isn’t trying. Her water bottle has been knocked over more times than I can count with her trying to climb it.